Thanks to everyone who joined us for our event at Bergmann Associates, and a special thank you to Sam Spata for the great presentation! A big thank you to everyone who attended our event at Vassar College! The building looks great and the tour was a huge success! Take a look at our photos from the event by clicking here. Thank you to all who attended our recent Lunch & Learn with David Briggs of loci architecture. Everyone had an enjoyable time learning about loci's restoration efforts in NYC and other locations in the north east. For more information about loci, please visit their website, http://www.lociarchitecture.com/. Also, thank you again to Davies Office for hosting the event. We look forward to seeing everyone at our next event! Thank you to everyone who made it to our October Lunch and Learn! We had a great turn out of 30 members and guests. Thank you to Brad Rogers and Bill Harris for a great presentation! Also thanks to Davies Office for hosting the event in their showroom and to Dave Mallard of Milliken Carpet for providing lunch. Please look below for some photos of the event. Our first event of October was a blast! 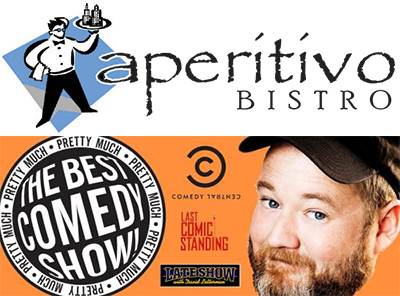 Thanks to Aperitivo Bistro for the great food and Underground at Proctors’ Best Comedy Show for helping us have a great night. Take a look below for some photos from our October 2nd event. On September 10, 2014, we had the privilege of touring the CDTA Maintenance Facility. Check out photos from our tour below. Thank you to everyone at the Clark Museum in Williamstown, MA for allowing us to tour your facility! We had a wonderful and informative time. For more information about The Clark and the architect behind it all, click here. Below are a few photos from our tour.